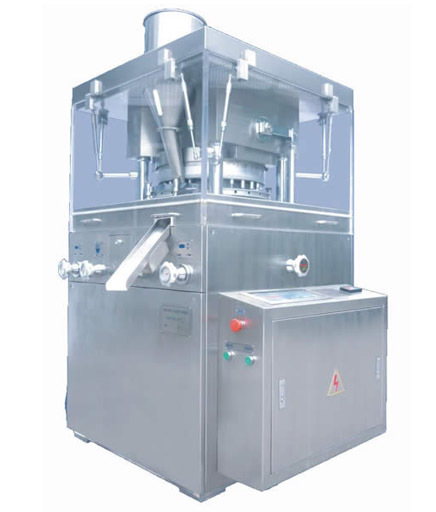 ZP-33E rotary tablet press machine is the latest type product, prominently characterized by high speed, high capacity, fully enclosed structure, attractive appearance, high efficiency, low energy consumption, environmentally friendly, long lifespan, easy for heat dissipation, simple operation, etc. It can be suitable for pressing all kinds of normal or abnormal tablets in food, plastic, electronic, chemical and pharmaceutical industries. 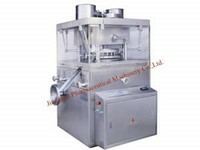 In response to GMP requirements, we adopt stainless steel as material contact parts of our rotary tablet press machine, the polished surface of its turntable, as well as organic glass perspective window for observation and maintenance. Furthermore, this device comes with over loading protection, driving system and hydraulic system for import frequency timing. Its punch die is ZP19 ZP33B type. As a whole construction for tablet operation, the upper portion of our rotary tablet press machine falls into upper punches, middle dies and lower punches. Among them, we evenly place 33 sets of punches and dies around the periphery of turret. Then, the upper and lower punches, which are located on the fixed camber tracks, will start up and down movements long the tracks once the turret makes rotational motion to accomplish the target of tablet. 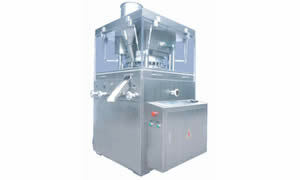 There are four main working procedures, including feeding, filling, pressing and tablets output. Jiangnan Enterprise is a rotary tablet press machine manufacturer and supplier in China. We offer a comprehensive range of products, including oscillating granulator, softgel encapsulation machine, AL-PVC-AL blister packaging machine, and more. ZP Series Rotary Tablet Press MachineZP series rotary tablet press machine is double pressing, continuous and automatic revolving type product, featuring carved appearance, special shape and double color piece. It plays an important role in pressing various granular into round piece, extensively applicable in pharmaceutical, food, chemical and electronic industry. 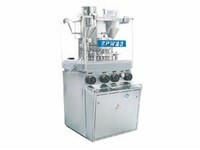 ZPW23 Rotary Tablet Press MachineZPW23 rotary tablet press machine mainly serves to produce different types of irregular tablets, such as double layer type, ring type and double side engraved type, in use of various granular materials. We can totally install 23 pieces of punches and dies in the turret, and the punch is composed of two detachable sections. Then, 23 tablets can be manufactured in one cycle of the rotation.